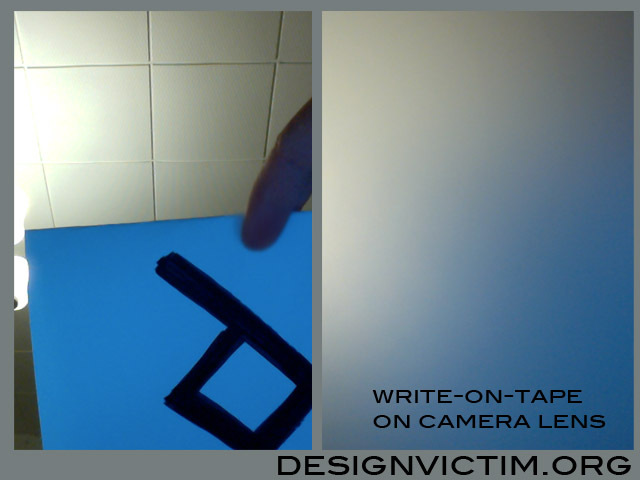 Write-on-tape blurs the camera image, but lets the camera determine room lightning levels. How to disable built-in laptop camera easily and neatly, but not permanently? Many people use awkward stickers or pieces of paper on their laptop cameras, because they are worried of their camera being hijacked, or are worried videomeeting programs turn camera on suddenly without a warning. But on some cases you cannot turn camera off for good, as some laptops and displays use the camera to determine the lightning of the room and adjust brightness accordingly. Here’s THE solution! Take a piece of write-on-tape (any opaque, slightly translucent tape will do, as long as it is easily unplugged away). Stick the piece on the camera lense. Camera will be able to detect the room light level, but the picture is all blurred if any malicious party access it. Peel the tape out when YOU want to use the camera, and replenish tape after done with your video conference needs. – If you think a piece of tape looks too odd, carefully use the holepunch on write-on-tape and you get pretty round small piece of tape, that should fit nicely onto the camera lens. – If any sticky residue is left on the camera lens, do not use detergents or water to remove it. Best way to remove stickies is to tap it gently with same type of tape. – If someone gets access to your camera, they likely can access the microphone as well. Tape doesn’t help much there. Keep your programs and computers updated. – Use this tip always with your own judgement and on your own risk 🙂 we are not responsible if something happens to your camera or gear. Techcrunch: Hackers can silently access your webcam via internet browser.